In the Clore Learning Centre, our dedicated space for people of all ages to get hands-on with theatre making, we offer regular opportunities to discover the skills and secrets behind the National Theatre’s productions. 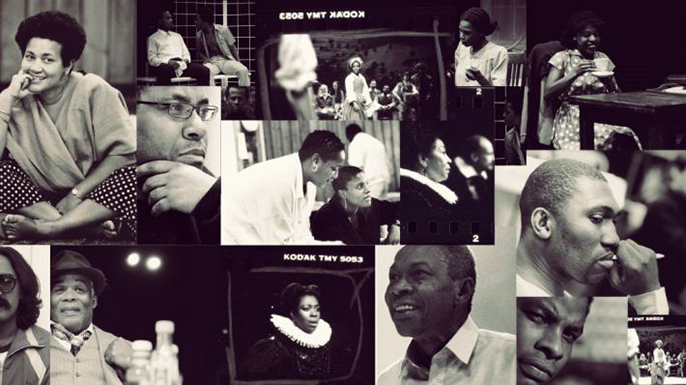 This six-week series explores a diverse collection of plays from dramatists of African and Caribbean heritage. Combining performances, clips of past productions and lively discussion, each session examines a topic – from teenagers and revolutions to sport and traditional rituals. The discussion is led by Natasha Bonnelame (previously the Black Plays Archive Project Manager) who will be joined by guest speakers. Exploring coming-of-age stories. Disenfranchised and voiceless, young people exist on the edge of their societies, confused, abandoned and ignored. Loss, identity, transition and transformation persist as the characters struggle to find their place in the adult world. Plays covered: Skyvers by Barry Reckord, Little Baby Jesus by Arinze Kene, Twice Over by Jackie Kay and Three Birds by Janice Okoh. In this session Natasha Bonnelame discusses the way playwrights of the African Diaspora have re-read and re-written European plays. This literary rebellion changes the focus and meaning of the plays, challenging Western assumptions. Acts of re-writing are not just dismissing what has come before. They reveal a relationship between old and new and ask us to reconsider cultural ownership in a globalised world. Plays covered: Days of Significance by Roy Williams, Women of Troy 2099 by Courttia Newland, Trinidad Sisters by Mustapha Matura and The Lower Depths by Tunde Ikoli. The plays discussed in this session feature characters that live on the periphery of society. They are set in care homes, children’s homes, mental health hospitals and prisons, where residents are excluded and disenfranchised from their communities. As the characters confront and examine their relationship with the outside, the role of the wider society, and the ways in which they treat those who are powerless and voiceless are questioned. Plays covered: Something Dark by Lemn Sissay, 24% by Paulette Randall, The Key Game by Patricia Cumper and Island Life by Jenny McLeod. Revolutions and coups from Haiti to Trinidad and Brixton feature in this session discussing the under-explored histories of the African Diaspora experience. Empire, colonialism and globalisation are key themes but important to all the plays are the questions of identity and race. Plays covered: Ragamuffin by Amani Naphtali, Rough Crossings by Caryl Phillips, Early Morning by Oladipo Agboluaje and Coups and Calypsos by M NourbeSe Philip. Boxing, football, rugby and snooker are the subjects of these plays. This session explores sports whose popularity developed at the end of the 19th century, at the height of European colonialism. During the 20th century these sports provided a route through which black people could move through the racial, social and economic divide. The sporting arena as a political and cultural space is discussed and its role as a symbolic site of the African Diaspora struggle. Plays covered: Sucker Punch by Roy Williams, Shoot 2 Win by Tracey Daley, Josephine Melville and Jo Martin, Sons of Charlie Paora by Lennie James and Four Hundred Pounds by Alfred Fagon. This session explores Caribbean folk myths, European folklore and Yoruba / Orisha rituals. In the process the playwrights reveal the struggle of the black working populations, the histories of Caribbean slavery and the development of African Diaspora cultures. Plays covered: Echo in the Bone by Dennis Scott, Unplanned by Malika Booker and Carnival Messiah by Geraldine Connor.